Save restaurants for special events. I haven’t always succeeded in this endeavour. Sometimes life gets in the way of my frugal intentions, sometimes a bit of self-sabotage but more often than not it was the result of poor (or complete lack of) organisation. So, if you’re like I used to be and sometimes struggle to avoid the fast food outlets and other meals of convenience, here are three simple tips to banish takeout from your diet and food budget forever. Nothing puts the brakes on meal preparation at home more than a messy kitchen. This is something I’ve battled over the years but the simple truth is: you need to clean as you cook. Make sure every single pot and utensil is cleaned before you do anything else. This is especially true if you work outside the home. Even if you think you’ll have time before you leave for work in the morning – you wont, so don’t risk it. If you come home to a disaster zone in your kitchen it’s guaranteed that you’ll opt for the easy solution – eating out – and your food budget will be the first casualty. Not everyone is in the position to have all their meals prepped and ready to go in the freezer, not everyone has a freezer big enough for the job. But, you can put a few meals aside for emergencies. Next time you’re cooking a family favourite, cook a double batch so you can put a full meal into the freezer. Ideally you need at least three emergency meal options available at any time. Some weeks are more trying than others so be prepared for more than one evening meal emergency during the week. And remember, a meal emergency can be as simple as not having a clue what to cook for dinner! In my house, pizza is the takeaway of choice. Once upon a time we used to have ‘payday pizza’, so once a fortnight we’d spend about $15 on pizza from our local restaurant. If we were to do that now, the pizza would cost closer to $20 – that’s a fair chunk out of our food budget! After a great deal of trial and error, I’ve perfected making my own pizza dough using my bread maker’s pizza dough setting (mine is an older version of this one ). I’ll share my pizza dough recipe soon – including my secret ingredient. Now, we make pizza at home. It’s usually just a simple tomato and cheese pizza with either chili flakes or Italian herbs sprinkled over the top, but it’s tasty and it’s cheap! We have the whole operation down to a fine art now and would never consider buying pizza again. Ever. Do you love fried chicken, or hamburgers, or maybe you love Mexican food. If you often head to the drive-thru so you can indulge in your favourite treat, try making it at home rather than paying someone else to make it for you. The added bonus is you know exactly what ingredients have been used so there are no hidden additives in your meal. Follow these three simple steps and I can guarantee you’ll eat out less, stop buying convenience meals and the drive-thru will be a thing of the past. Both you and your grocery budget will be a lot healthier, too. Do you have any tips or tricks to share for avoiding eating out? Why not share them in the comments?! We do a pretty decent job of not eating out too much. Our “restaurant” budget is wrapped into our grocery budget, so it we eat out more than once or twice in a month, that just means less money to spend at the store. I guess I would rather have plenty of food to cook with vs. eating out a few times! I’m like you, if it gets spent on eating out, there’s less for groceries and as I’m doing my best to cut the food budget to the bone… eating out has too big an impact and has to go! Thanks! I’m in awe of your ‘no spend’ YEAR! If only I was organised enough to have the menu on the fridge. I live in hope! I hardly ever buy takeout these days as like you, I tend to try and cook my favourite takeout meal (curry!) at home. Actually, my husband is more the chef in our household than I am. To be honest, we only have takeout a few times a year! That wasn’t always the case. Before we started tackling our debts, we’d have takeout once per week and eat out frequently too. 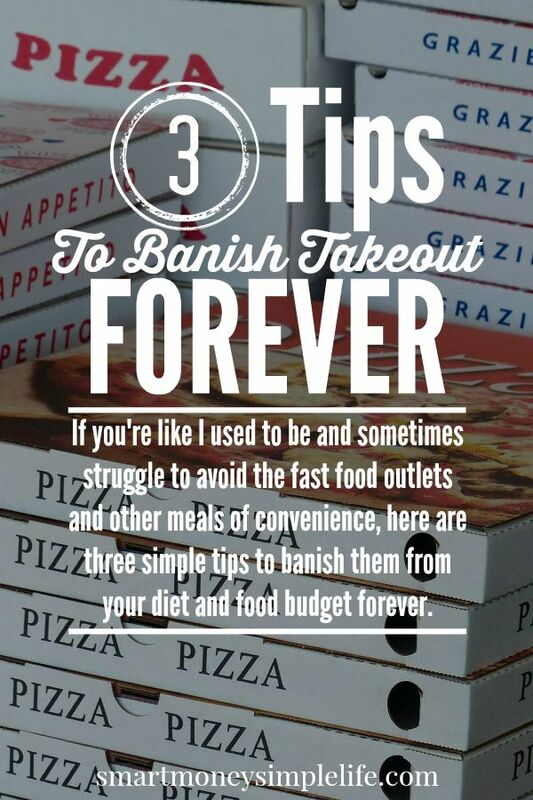 These three tips I agree can really help you stay away from takeout. What works for me is preparation which means cooking ahead on weekends and freezing the food for the week, or cooking quick meals with few ingredients. This takes away the excuse of eating out, and the food always taste so good when you cook it from scratch. And, it’s always so much better for you when you cook from scratch. No added nasties. Making my own sauces and dressings helps a lot. It makes the food so much more flavorful. Pinterest is also a great way to get inspired in the kitchen. Pinterest. Don’t you love it?! So much inspiration, so little time. Freezer meals have been my favourite thing this winter, they make life sooo much easier! I still have to remember to take them out the night before, but boy do they cut down on the ‘scrambling for food at the last minute’ situations, which usually lead to buying Subway. There’s nothing better than being able to grab something out of the freezer and have it ready to go when you get home. It all comes back to organisation. But, the effort is so worth it.